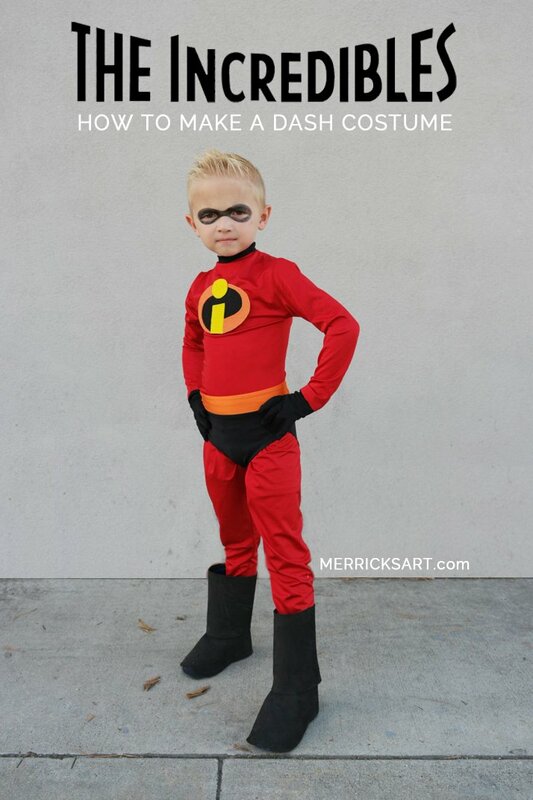 Want to DIY some Incredibles costumes for Halloween this year? I’ve got you covered! This tutorial walks through the costumes for Dash, Jack Jack, and Frozone! If your kids are anything like mine, they saw the Incredibles 2 movie and instantly became obsessed with the characters. So of course they wanted to be them for Halloween. 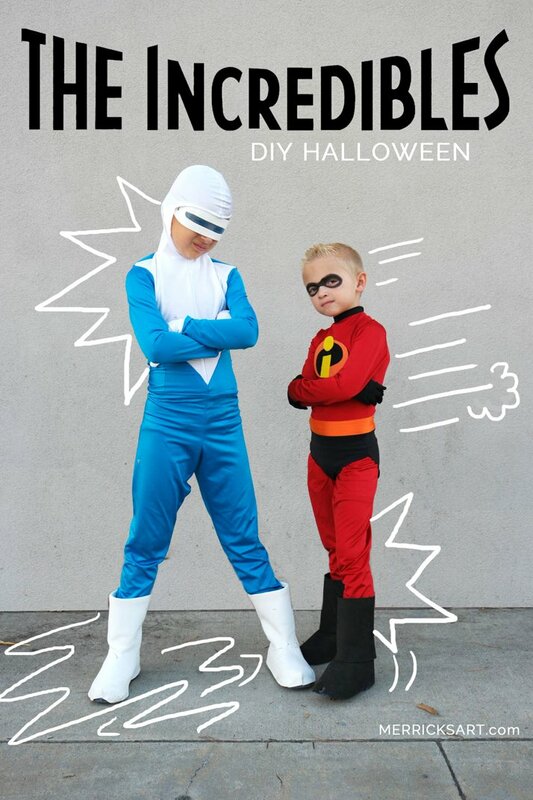 Make these Incredibles Halloween costumes or buy them! I’m sharing a step by step sewing and DIY tutorial for Dash, Jack Jack, and Frozone Halloween costumes below. And you can use the same Dash instructions for the other family members! 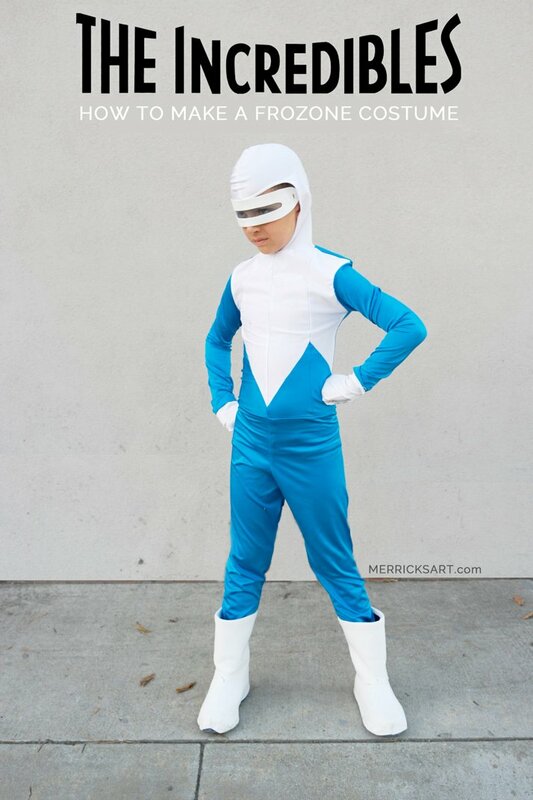 If you’re not a DIY kind of girl, you could just buy the costumes for DASH, FROZONE, and JACK JACK online here! lots of pins to use as you sew, cause this fabric is slippery! Cut your pieces. You’ll need 2 LEGS, a BODICE FRONT and BODICE BACK (this will be 2 pieces), 2 SLEEVES, and a NECKLINE. 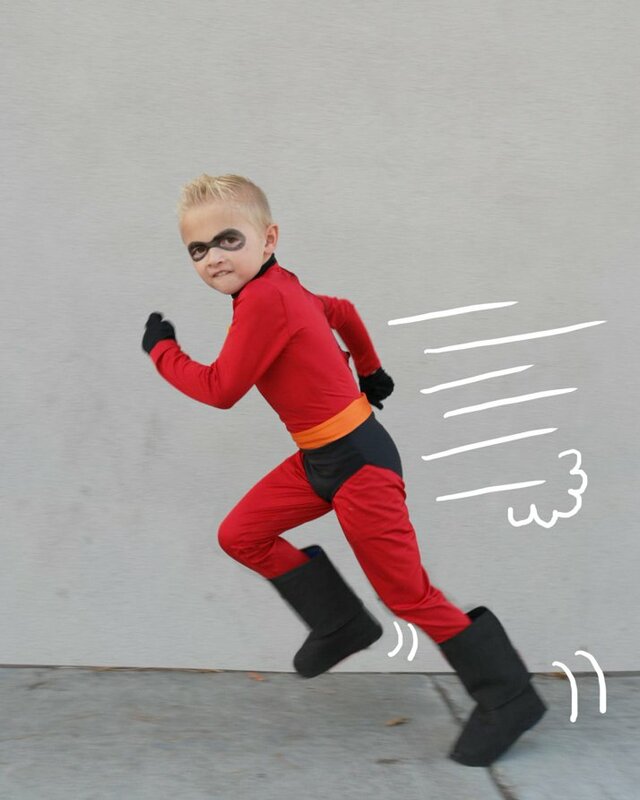 I used a neckline for our Dash and Jack Jack costumes, and a HOOD (step 10) for the Frozone costume. Fold your leg pieces in half (with right sides of the fabric together), and sew up the sides. Repeat for both legs. With right sides of the fabric touching, tuck one pant leg inside the other pant leg, and pin together, then sew from waist band to waistband, going under the crotch. Take your BODICE FRONT and BACK pieces and sew them together at the shoulder seams. Now it’s time for sleeves. Take your BODICE and lay it open flat, right side of the fabric up. Line up the top of the shoulder curve of the SLEEVE with the shoulder seam of the BODICE (right sides together), as shown in the illustration. Pin in place. Now pin down both sides of the shoulder curve, pinning the SLEEVE to the DRESS. Once it’s pinned, sew them carefully together, up and around the curve. Repeat for the second SLEEVE on the other side. With right sides of the fabric together, pin the top from wrist to armpit, and armpit to hemline. Make sure those armpit seams are matched up. Then sew from wrist to armpit to hemline with a straight stitch. Repeat on the other side. Now that your bodice is done, attach your pants and bodice at the waist. Stuff the bodice inside the pants with right sides of the fabric together, pin all the way around the waistband, and then sew with a straight stitch all around the waistband. Attach your velcro pieces up the back. Take your NECKLINE LINING piece and fold it in half (wrong sides together). Pin it to your neckline, stretching as you pin, and then sew all the way around the neckline to attach the lining. If you’re doing a hood, cut out your hood pieces now. With right sides together, sew your hood pieces together. Leave a little slit at the back open — this makes it easier to put on once it’s attached to the super suit. Hem the front of the hood and the slit so the edges are not raw. With right sides of the fabric together, attach the hood to the super suit with a straight stitch. Cut a piece for the front of the underwear, the back, and the waistband. Sew the black underwear pieces together at the sides and underneath. Then fold the orange band in half and sew across the short end. 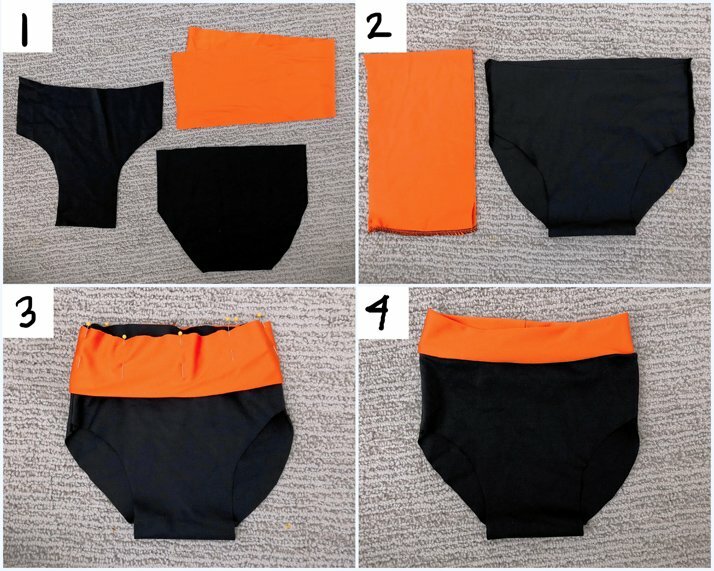 Fold the orange band in half to create a folded tube and stretch over the waist of the underwear. Sew around the waist, attaching the waistband and the underwear. 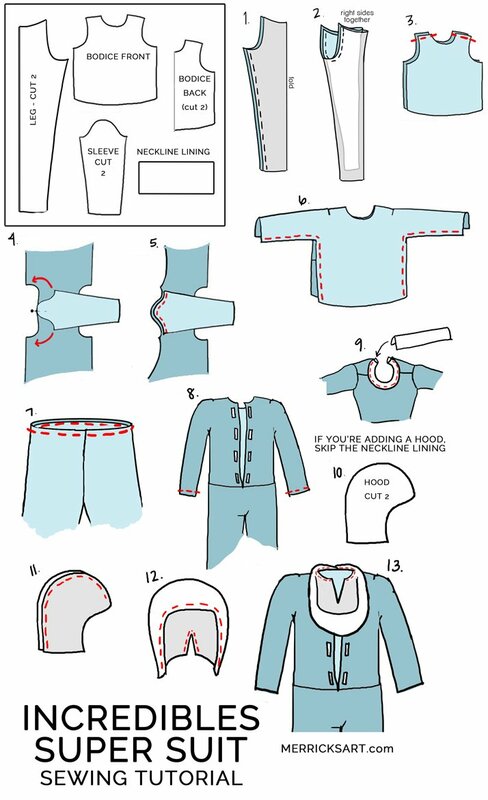 Fold the waistband up. The folded edge should be at the top. 1. Cut the rough shape in step one. Place it over the top of the boot and hot glue in the back. You can glue to the rim of the sole of the boot without damaging the boot, but this is optional. Cut a little slit in the front of the toe, and then overlap the foam and glue in place. This will help it mold around the toe of the boot better. 2. 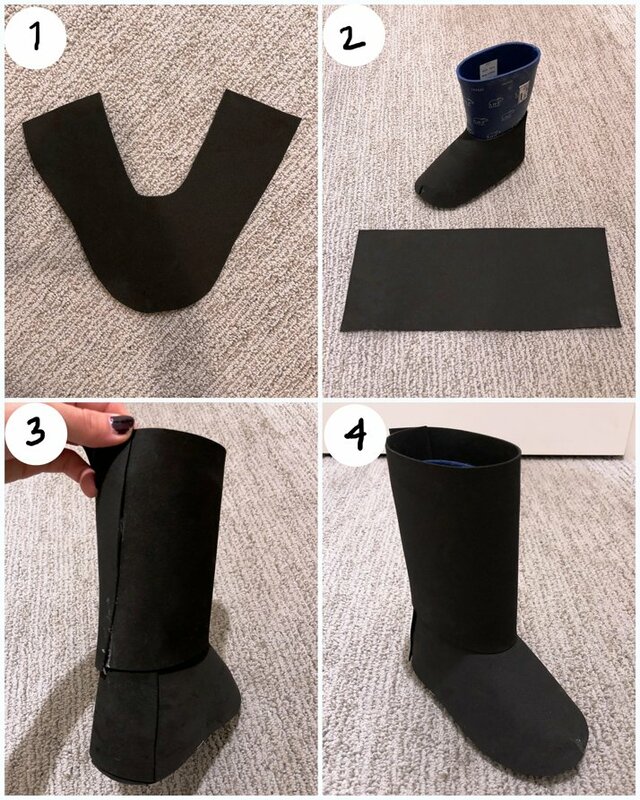 Cut a large rectangle of foam sheet, big enough to wrap around the entire shaft of the boot. 3. Wrap it around and hot glue the ends together at the back. 4. I didn’t glue to the boot at all, and the two pieces of foam sheet are separate. Repeat for the second boot! 3 sheets of felt (yellow, orange, and red) – I bought the “premium” sheets cause they’re a little more sturdy. Use a pair of scissors to cut the shapes of the incredibles symbol, then hot glue together. Hand stitch, hot glue, or machine stitch the symbol on to the chest of your super suit. I hot glued it and it worked great. Cut a piece of foam sheet in a long oval, then cut a skinny slit all the way down, as shown in step 1. Cut the water bottle in half, and then cut a strip of the blue plastic that’s big enough to fit over the mask eye slit. Use hot glue to attach the blue plastic over the eye slit. Cut a slit in the foam sheet on each side, and then slide each end of a strip of elastic through each slit. 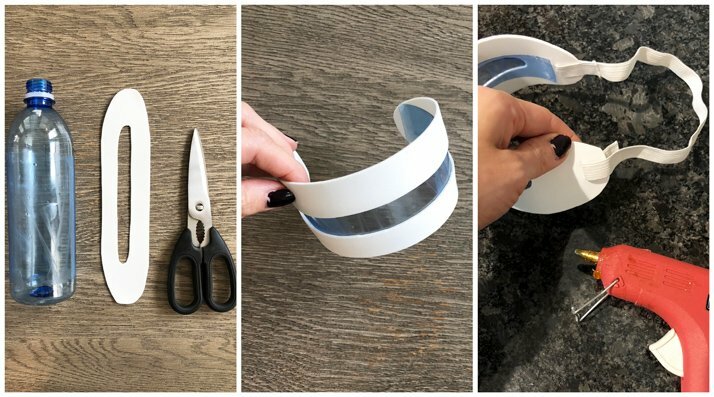 Fold the elastic back on itself and glue in place. We opted not to do real face masks, cause I knew it would drive my kids crazy. So instead we did black face makeup and painted their masks directly onto their faces. Then we found black and white gloves at Party City, and our looks were complete! Even though homemade costumes take more time, and often cost the same as a store bought costume, I love the labor of love. 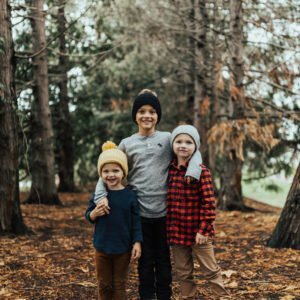 And honestly it’s the only time of year I sew something for my kids! If you make these costumes, share on your instagram stories and tag me so I can see! If you want more Halloween costume ideas, check out some of our past years below! Is THERE A WAY TO GET THE PATTERN PEICES? ALSO HOW DID YOU GET FROZONES PATTERN ON HIS SUIT? Hello, great tips, thank you! When I dressed my son for Halloween I used the article sugar skull jewelry to use the right biker jewelry. They together with a leather jacket create an excellent brutal look!